Rediff.com » Business » After building a billion-dollar business, Subhash Chandra to enter politics? 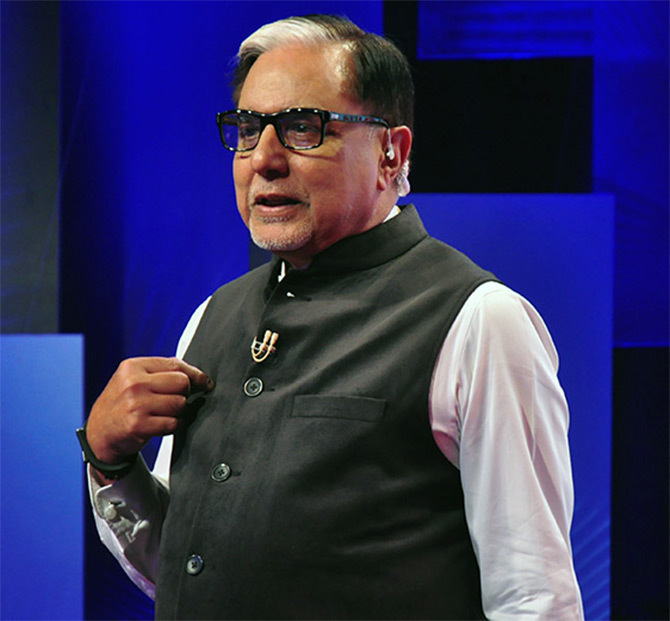 After building a billion-dollar business, Subhash Chandra to enter politics? Zee News, Zee Media's flagship brand, was at the centre of a controversy over its media practices that pushed Subhash Chandra towards BJP, says Vanita Kohli-Khandekar. The rumour mills have been working overtime on Essel Group Founder and Chairman Subhash Chandra's political aspirations. The plain-speaking rice trader, who built a $3-billion empire out of a defunct family business, has been making moves that point to a future in politics. It started with campaigning for the Bharatiya Janata Party (BJP) in his hometown, Hissar, during the 2014 general elections and continued with The Z Factor: My journey as the Wrong Man at the Right Time, his autobiography. His closeness to BJP, ideologically and otherwise, is well documented in the book which was released by Prime Minister Narendra Modi earlier this year. So when Chandra stepped down from the post of non-executive chairman of the Rs 544-crore Zee Media Corporation earlier this week, there was a strong buzz again on the beginning of a political career for him. "I have no political ambitions," Chandra, 65, had said in an interview with Business Standard in February, after the release of his book. "In our country anyone who talks about nationalism or Hindus is considered a BJP person. Many media owners are clearly aligned with the Congress but nobody raises a finger on them. Sure, I do agree with certain parts of the BJP ideology. But neutrality is also necessary (to be in the media business). I am friends with everybody," he had added. He shrugged off the suggestion of political ambitions, again, after the Zee Media announcement. On stepping down from group firms, Chandra pointed out that he has slowly been getting out of businesses that were being run, independently in any case, by his brothers, like Dish TV or Essel Propack. With Zee Media, though, he says the move is aimed more to insulate himself from the whole rigmarole of defamation suits and the other things that go with running a news channel in India. Materially, the move is not very significant. Chandra remains the chairman of the Rs 19,324-crore (FY 2015) Essel Group which has interests in infrastructure, leisure, media and packaging. Zee Media, including Zee News and DNA, made up nearly half (47 per cent) of the group's revenues last year. These days Chandra is more focussed on the group's infrastructure and education initiatives. Of the group's media business, he is still actively involved with Veria Living, a lifestyle channel that operates out of New York. Zee News, Zee Media's flagship brand, was at the centre of a controversy over its media practices that pushed Chandra towards BJP. Chandra got his first big break in the 1980s, courtesy Rajiv Gandhi. In 2012, came a public fallout with Congress Member of Parliament Naveen Jindal who accused Zee News editors of demanding a bribe for going easy on their coverage of Jindal's alleged involvement in the coal scam. Chandra was named in the FIR and grilled for hours. "This was an unjust act of the United Progressive Alliance and, in response, I personally supported Narendra Modi's campaign for prime ministership," says he in his book. If this is a journey that began with the Zee News controversy, much of what could happen is yet to unfold.